Parks are an integral part of our outdoor spaces and contribute to making our environment feel livable. Parks can be a great tool in helping older adults live an active and healthy life. 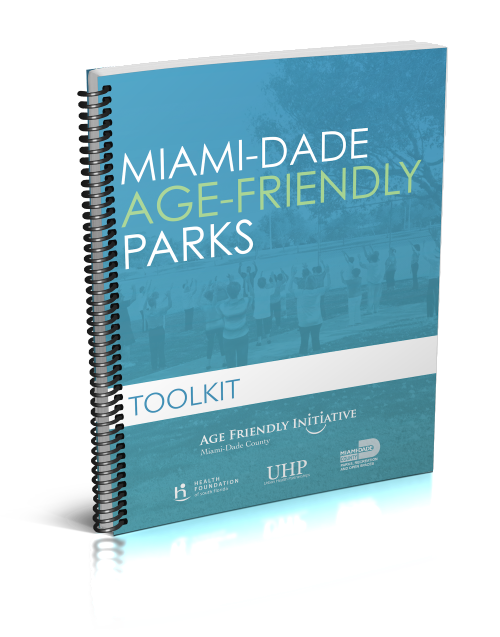 This Age-Friendly Parks Toolkit contains practical tools and resources to implement similar strategies within your own community, including attributes and components that Miami-Dade County Parks, Recreation & Open Spaces has implemented at pilot parks as examples. It is designed to provide a general understanding of the different components of an age-friendly park, their importance, and a guide through the process of creating age-friendly locally by identifying the necessary policies to implement the changes throughout the existing parks in your community. Finally, we have created an Age-Friendly Park Standards system, which will help you evaluate parks in your community and determine the priority areas for change. We hope that this information will help create age-friendly parks throughout Miami-Dade County, because age-friendly parks are parks for everyone. Age-friendly parks are just one piece of the puzzle as we work toward making all of Miami-Dade County more livable for people of all ages, especially older adults.